Does this prayer sound familiar? 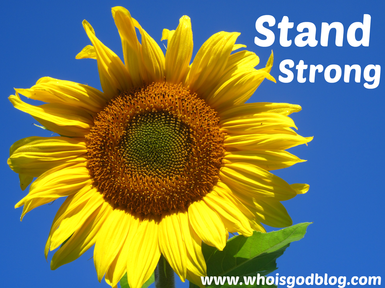 Find out how to stand strong! It wasn’t long after that when hardy leaves began to poke up and each hole had 5 or 6 bright, healthy looking seedlings. But like most plants, the sunflowers had another admirers who had a taste for them -- especially my archenemy -- the slug. One night my daughter and I would enjoy the growth of the sunflowers and the next, I’d go out to the garden to see sad little leafless stalks where our plants once stood. We replanted the ones we lost again and again. And did our best to surround the delicate, “tasty” seedlings with small fortresses of sharp rocks, hoping to make things difficult for the slimy marauders. I even did a little research and found that copper wire was supposed to give the slugs an uncomfortable “zap” when they crawled across it, so I grabbed pennies and encircled some of our new plantings with them. But maybe my pennies were low on copper, because the slugs continued to feast. Little by little our sunflowers grew though. It seemed that once they got past the stage of being “tender,” the slugs didn’t bother them so much anymore. And as the sunflowers got taller than my daughter and eventually even taller than me – we enjoyed going into our little “garden house” and getting shade from the hot sun. Our walls were covered by giant tear-shaped leaves and topped with bright flowers of sunshine. A few weeks ago, as I was harvesting snow peas, my daughter called me into the sunflower house and together we marveled at how it had grown. One flower especially looked to be over 10 feet tall! My eyes focused on their thick stalks and I saw the little circles of “slug deterring” rocks still around the bottom of each one. I remembered the tough start they had and marveled at where they were now. No slug was going to mess with them any more! As I eyed the stalks, I thought about our lives. We too, go through seasons of tenderness don’t we? Now, I know this isn’t a bad thing, but when it comes to vulnerability to Satan and his attacks – it can make things a whole lot more difficult than they need to be. We’re not meant to be wimpy Christians battered down by the evil one. I remember the day I first realized this. I had been listening to lies about myself for quite a while and the burden was a heavy one to carry. I bet if you saw me in the spirit – I probably looked like a chewed up baby sunflower! I was driving home that day and the realization hit me that God did not intend for his kids to be beat up by the devil. Instead, we had at our feet all the resources we needed through Jesus, the Holy Spirit and the Bible to be able to stand strong in times of spiritual attack. Wow. Had I been missing something or what? It’s taken time and it sure can be a spiritual workout some days. But I smile now when I think of those thick, sturdy sunflower stalks. And I like to think that day by day my life is getting closer to looking like them. During worship this Sunday, we sang a song called, “Your Name,” that describes God’s name as being a strong and mighty tower. And on the lyric’s screen was an image of a sturdy lighthouse being pummeled by monstrous waves. The lighthouse stood its ground, however, sending a clear message to the waves that they were no match for its strength. Are you under attack today? Has life thrown you a crushing curve that you’re not sure you can stand up against? Or is your mind under siege with thoughts that aren’t from God? Call on Jesus who alone can help you stand strong. 32 He fills me with strength and protects me wherever I go. 33 He gives me the surefootedness of a mountain goat upon the crags. He leads me safely along the top of the cliffs. 34 He prepares me for battle and gives me strength to draw an iron bow!